Scientists at Pacific Northwest National Laboratory (PNNL) are unraveling the biochemical mechanisms responsible for radiation-induced bystander effects (RIBE)-effects that produce a biological response in cells next to those actually exposed to radiation. These findings will be important for improving risk analysis of radiation exposure because of the growing evidence of adverse effects including cytotoxicity and genomic instability in cells not directly hit by radiation. The work is supported by the Office of Biological and Environmental Research within the U.S. Department of Energy. The hypothesis being addressed is that bystander effects are caused by shedding of cell surface proteins generated by regulated proteolysis in response to low doses of radiation. Shed proteins were previously discovered in media taken from human mammary epithelial cells after treatment with phorbol ester, a known shedding inducer. However, after radiation exposure similar changes were not observed, and subsequent assays for bystander activity in collaboration with Carmel Mothersill, Director of the Radiation and Environmental Science Centre, Dublin Institute of Technology, showed no bystander activity. Subsequently, the research team conducted a radiation study using Chinese hamster ovary (CHO) cells because the bystander response is better characterized in these cells and large numbers of cells can be grown thus providing enough material to rigorously analyze for shed proteins. Samples were evaluated by both tandem ion trap and FTICR mass spectrometry in the Environmental Molecular Sciences Laboratory at PNNL. Mass spectrometry outputs were analyzed using a recently developed discriminant analysis procedure developed in EMSL (Strittmatter et al. 2004), which provides a confidence score based on Sequest parameters, tryptic nature of the peptide, mass, and retention time (see attached figure). Using this approach, the number of high-confidence identifications from the samples doubled; the PNNL group identified approximately 500 proteins in the media, about 10% of which contain a trans-membrane domain; hence, they likely shed (Ahram et al., manuscript in preparation). Despite the increased sensitivity of the FTICR and the improvements in informatics, relevant changes attributable to radiation were not observed. It's unclear whether this is because of the very modest bystander response of cells to low linear energy transfer (LET) radiation, but it does point to the need for a model system with a robust bystander response. The PNNL group believes that the DIE (death-inducing effect) model described by Nagar et al. (2003a,b) represents many characteristics of the bystander response and provides the robustness needed for scientists to identify and quantify proteins released from the cell surface in response to radiation. Currently PNNL scientists are conducting cell culture studies to determine whether the DIE activity can be prevented with inhibitors of shedding, and cell culture media manipulation studies to determine whether DIE activity is attributable to cytokines, growth factors, or other proteins. The data shown here are protein identifications for cell culture media taken from Chinese hamster ovary (CHO) cells. Samples were analyzed using both tandem and FTICR mass spectrometry followed by a new statistical analysis method that uses discriminant analysis for peptide/protein identifications. Because there is no protein database available for the hamster, the mass spectrometry data were searched against both mouse and human databases. PNNL staff identified 497 proteins with about 1/3 common to both databases and 2/3 coming from each individual database. The results demonstrate that in the absence of a sequenced and annotated genome, large numbers of proteins can be identified provided that databases for closely related organisms are available. Ahram M, JN Adkins, DL Auberry, DS Wunschel, and DL Springer. 2005. "A Proteomic Approach to Characterize Shed Proteins." Proteomics 5(1):123-131. DOI:10.1002/pmic.200400912. Ahram M, EF Strittmatter, ME Monroe, JN Adkins, J Hunter, JH Miller, and DL Springer. 2005. 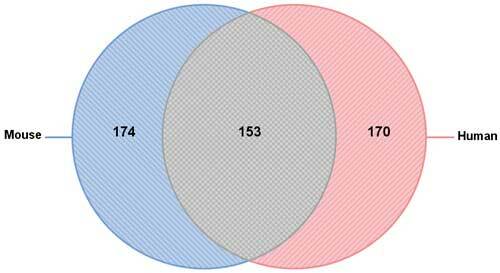 "Identification of Shed Proteins from Chinese Hamster Ovary Cells: Application of Statistical Confidence using Human and Mouse Protein Databases." Journal of Proteome Research 5(7):1815-1826. DOI:10.1002/pmic.200401072. Nagar S, LE Smith, and WF Morgan. 2003a. "Characterization of a Novel Epigenetic Effect of Ionizing Radiation: The Death-Inducing Effect." Cancer Research 63(2):324-328. Nagar S, LE Smith, and WF Morgan. 2003b. "Mechanisms of Cell Death Associated with Death-Inducing Factors from Genomically Unstable Cell Lines." Mutagenesis 18(6):549-560. DOI:10.1093/mutage/geg033. Strittmatter EF, LJ Kangas, K Petritis, HM Mottaz, GA Anderson, Y Shen, JM Jacobs, DG Camp, and RD Smith. 2004. "Application of Peptide Retention Time Information in a Discriminant Function for Peptide Identification by Tandem Mass Spectrometry." Journal of Proteome Research 3(4):760-769. DOI:10.1021/pr049965y.